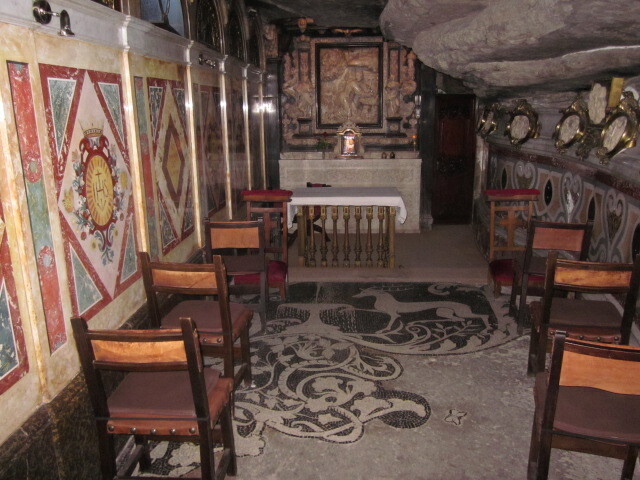 The Cave, over which the present day Retreat House of La Cova Sant Ignasi in Manresa, is built has special significance for the Jesuits and has been considered a sacred space for those devoted to Saint Ignatius since the early 17th Century. Originally, an open shelter in the rock when Ignatius was thought to have prayed here, it has gradually been formed into what it is now, as large number of visitors came here. In 1603 a small chapel was built and as visitors increased new buildings were erected dignify the space. What you can see from the picture is the original cave with the overhanging rock. The wall to the left has been erected shutting in the original opening. 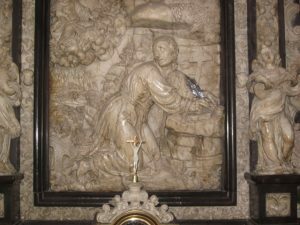 At the back of the altar is an alabaster sculpture by Joan Grau depicting Ignatius writing the Spiritual Exercises. 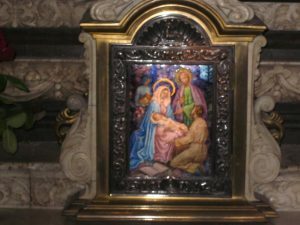 The tabernacle just below the sculpture, also the work of an artist shows Ignatius assisting at the Nativity (see below). The mosaic work on the floor show the weeks of the exercises, beginning with the temptations of the first week – the dragon; the temptations of the second week – the serpent, and the third and fourth week being depicted by the Stag and fountain.